The children in Pippins class have started their Autumn topic. We made bread rolls in the shape of hedgehogs and used our handprints to make autumn leaves. Forest fun on Wednesday was great fun with all the children returning from the mud kitchen cov-ered in most of the mud! 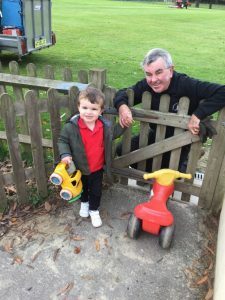 Groundsman Richard also known as ‘Grandad Richard’ is proving very popular amongst all the class as his grandson Jack (one of our new members) loves watching him on the big tractor! Acorns class have been continuing their nursery rhyme topic by singing Humpty Dumpty. We had great fun creating our own Humpties, covering them in plasters! We also looked at the differences between hard boiled eggs and uncooked eggs, and what happens when they are dropped from a height! We also enjoyed joining Pippins for Forest School on Wednesday, enjoying the feeling of the cold wet mud on our hands, creating lots of different creatures. Oaks have been looking at the changes that happen to our natural world in Autumn. We have collected different coloured leaves and have been amazed by how bare the trees look without their leaves! The children have been mixing powder paint to create beautiful Autumn colours. We also dressed up in spots for Children In Need and decorated some yummy cakes to sell at the cake sale.